Will Anderson inadvertently breaks up a key suffrage rally when he thwarts a gunman set on killing his lover, Elizabeth Hume. No one else saw the man, and Elizabeth believes he hallucinated the entire incident, a side effect of the radium “treatment” he received at Eloise Hospital. She asks him to sit on the sidelines while she and her companions try to get the women’s suffrage amendment passed by Michigan voters. Instead, Will sets out to protect Elizabeth and prove his sanity. Will’s nemesis, Sapphira Xanakis, contacts him with news of a conspiracy to defeat the amendment, led by Andrew Murphy, head of the Michigan Liquor Association. Against his better judgment, Will believes she is trying to help. The man she directs him to dies under suspicious circumstances. An old acquaintance of Will’s, who is working for the MLA, is shot and killed in front of him. Still, no one believes Will, including his former ally, Detective Riordan, who not only is unwilling to help, but seems to have secrets of his own. With new death threats against Elizabeth and the next rally only a few days away, Will has to unravel a complicated tapestry of blackmail, double-dealing, conspiracy, and murder—before the killer has his next chance to strike. 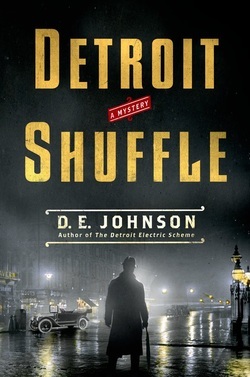 Johnson’s immaculate plotting and high-tension writing make for a spellbinding read set in early twentieth-century Detroit.